Yes, you read that CORRECTLY. Michael Mendheim, the creator of the original games has opened a Kickstarter for a new Mutant League Football. The funding for the project is open until October 16th, 2013. 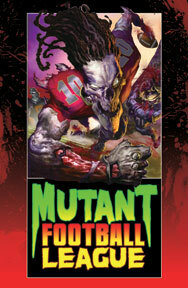 I also just noticed it's switched to Mutant Football League. As a generally disinterested-in-sports person, I did love the Mutant League games. Granted I was also a fan of the NBA Jam games and the various Boxing games out there, but the Mutant League games opened up an interest in sports. Not much, but at least a little. The old Sega Genesis version was a violent, yet hilarious parody of American Football. I recall getting penalties for booger picking and throwing peoples torn off heads. I would personally like a new version of Mutant League Hockey, but this is a start. So far it's only planned for iOS, Android, and X Box Live. I may support it if they port to Playstation or Vita. And I'd definitely support it if they announce a new Mutant League Hockey. Hell, if they could make an immense retro 16 bit version of the game, tons of fans would donate just for nostalgic glory.